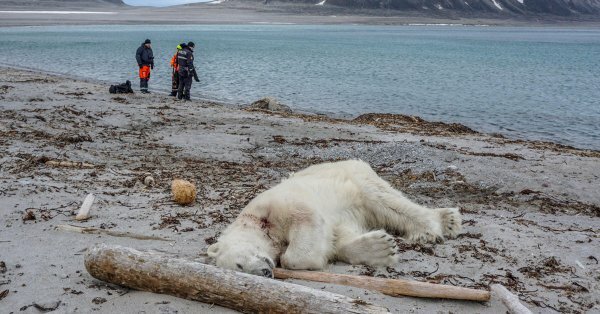 A polar bear guard was leading tourists off a cruise ship on an Arctic archipelago on Saturday when Norwegian authorities said a polar bear attacked him causing injuries to his head. The cruise company said another guard was forced to shoot the polar bear in defense. A tweet from The Joint Rescue Coordination for Northern Norway said that the attack happened just as the tourists from the MS Bremen cruise ship landed on the most northern island of the Svalbard archipelago. It is a region located between mainland Norway and the North Pole popular for its remote terrain, glaciers, reindeer and polar bears. The guard was not in a life-threatening condition. The company has yet to reveal his identity, as well as the other guard who shot the polar bear. Etminan also emphasized that all cruise ships traveling in the northern region are obliged to have polar bear guards aboard. It was not made clear, however, if anything triggered the polar bear to attack. It is also not clear if there could have been other ways the bear could have been contained without having to fatally shoot the animal. Social media users are reacting to the news, many taking to task the cruise ship operators for daring to go to where the polar bears live, and not expecting that they will not cause an incident. Arctic tourism to the region has increased significantly in the last few years and is now in high season. A Longyearbyen port schedule showed that 18 cruise ships are set to dock at the Arctic port next week. HEY !!! Snowflakes and general Pink Hat wearers. This the Largest Bear in the world. It is a Wild Animal and attacked a Human. Putting Flower in its paw won't stop it. Is you justification for whining there 6 billion of US vs 30,000+ of them, so we can spare a few? Using the latest LIBERAL ILLEGAL Agenda rant and crying whine. Isn't that polar Bear EVIL, because if it kills a human isn't the polar Bear separating that person from his family?